Calling 911 may seem like a basic process, but it is good to know what to expect if you ever have to call in an emergency. If your home has more windows than average, motion sensors could be a great option for you. Motion detectors help secure an entire room with just one sensor, saving you money and simplifying installation by reducing the number of sensors you need to help secure your home. Step 1: You have an emergency, which is when you need help to save a life or want to report a crime or fire. Step 2: You dial 911–make sure you stay calm. Step 3: A local dispatcher answers your call. How Does Your Call Get Directed to the Right Center? When you call from a land line phone, the number determines which 911 dispatch center is the appropriate one for your location and transfers your call there. These dispatch centers, also known as a Public Safety Answering Point (PSAP), have phone numbers that are assigned to come into them. If you call from a cell phone, your call will transfer to the appropriate PSAP and emergency responders will be sent to the location of the emergency. Step 4: The dispatcher asks questions about your emergency. Step 5: Dispatcher prioritizes the call based on urgency. Step 6: Dispatcher sends emergency responders. Step 7: Follow dispatcher’s directions about how to proceed. Step 8: Wait for help to arrive. Crimes you should call 911 to report include those currently in-progress or that just occurred, as well as any suspicious activities, fights, riots, and severe traffic accidents. If it is a building on fire, do you know if anyone is inside? Do you know if anyone is hurt? Are any structures threatened? Are flames moving close to any homes or buildings? 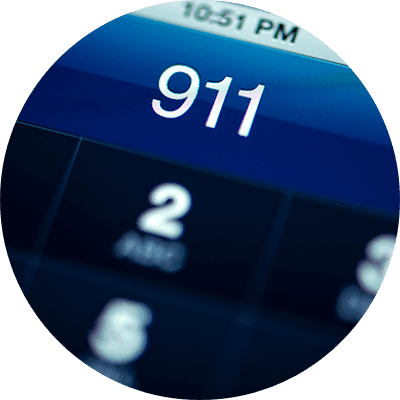 Unsure if You Should Dial 911? The victim’s condition is life or limb threatening. The victim’s condition could become life or limb threatening. Moving the victim will cause further injury. The victim needs skills/equipment that paramedics have. The distance or traffic conditions could cause a major delay in getting the victim to a hospital. There is a threat to a life or property. You want general police information, the time, a weather report, or local directory assistance. You have small cuts, bruises, the flu, or a broken bone (unless partially or fully amputated). However, in the event of a traumatic fall or accident, these minor external injuries may be signs of more serious internal injuries. Use your better judgment to determine if that is the case. You want to report a non-emergency, like a noise complaint, stray animals, or glass on the street. You want to set up ambulance transportation to medical appointments. Your cat is stuck in a tree. Prank calls not only waste time and money, but can also be dangerous and illegal in some areas. If 911 lines or dispatchers are busy with prank calls, someone with a real emergency may not be able to get the help they need. If you or any of your loved ones ever need emergency services, you will want the lines to be free and not occupied by a prank caller. If you call 911 by mistake, stay on the line, and tell the dispatchers that everything is ok. If you don’t, they may have to send a police officer to the location to make sure there is not a problem, wasting time and resources, which you may have to pay for.